Minimum requirements: 64-bit x86-64/AMD64 CPU and 1GB RAM. Most Intel and AMD CPUs produced after 2008 support 64-bit (including many Intel Atoms). super-grub2-disk website. Look for file supergrub2_x86-64.EFI. Copy file to EFI fat32 boot partition among the other UEFI boot files. Use this to help select / manage which partition you wish to boot when grub is borked. to import pictures from smart phone using MTP media Transport Protocol. All very fast execution. USB flash drive writer tools. http://rufus.ie. Rufus 1.5 megabyte single file application for Windows operating system. http://etcher.io . Balena Etcher tool supports Windows, MacOS, and Linux for safely writing a single .ISO file to a USB flash drive. 50 - 70 megabytes in Size. My Twitter post link to here. Here you go, tryout a 2.5" inch SATA SSD solid state drive in your laptop or desktop to improve Steam Gaming experience. 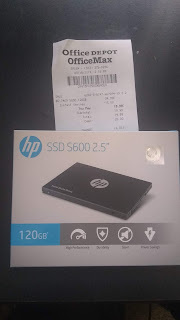 I will post about installing LinuxMint 19.1 Tessa to this SSD and then install Steam and update drivers. Cinnamon, Mate, or Xfce Desktop Environments your choice. You may repeat run this bash shell script file ./build_convergence_zenity.sh. It will update your LinuxMint operating system, create a couple desktop icons, and install Steam application to your user. I welcome you questions and comments below to create a better Steam Installation experience. you are tired of the Windows 10 nonsense, and want to try an alternative operating system, Linux Mint is a great starting point. Make no mistake, however, even though it is a good option for beginners, many experts use it too. Today, the newest version becomes available for download -- Linux Mint 19.1 "Tessa." This follows a fairly short beta period. Asus Just Gave You 1 Million Reasons To Switch From Windows To Linux. Cyber-security and antivirus company Kaspersky dropped a bomb on Asus laptop users this week, revealing that malware was distributed through the Asus Live Update utility. It masqueraded as a legitimate security update, and even boasted a "verified" certificate -- hosted on Asus servers -- to make it appear valid. Well what is your opinion? Sticking with Windows 10? Want to change to Linux? DistroWatch informattion on 100 Linux distributions. Would you like to buy a 120 Gigabyte 2.5" Sata SSD disk drive with one of those 6 linuxes preinstalled and with application Steam already installed? $49.00 plus shipping sent via United States Postal Service (USPS) to any of the 50 states and Puerto Rico. Fred Finster Email me Here. I will respond to your questions. It should work with any Bios. The Goal here is to create a usable Live Linux or BSD computer environment on a USB Flash Drive. You can carry this personalized computer environment in your own pocket. It is stable and will allow you to connect to the interenet through Wi-Fi or ethernet interfaces. You may give this USB Flash Drive to someone that does not have a computer. Maybe they find a computer with out a hard disk drive. Plug in this Live Linux USB Flash drive and computer will boot up and be useable! I like and use PuppyLinux XenialPup 7.5 (supports UEFI Bios)or Slacko Puppylinux 6.3.2 (supports legacy BIOS). These are small 300+ Megabytes .ISO file image size. RaspberryPi Pixel Desktop for x86 is large and good Debian 9 "Stretch" Linux with a Pixel Desktop Environment. From a PuppyLinux Forum entry Newbies - Puppy needs YOUR help too! There are certain quirks that are annoying. I suppose if one is not familiar with linux they are stressful. if not for the people who create programs and lend their experience on this forum, it would be a complete horror. A person would have to realize that any open source program usually relies on volunteer effort and doesn't have to adhere to more stingy corporate Microsoft guidelines. To me, over the last 10 or years it's been a learning curve mixed with challenges. It taught me discipline and when to walk away without killing or breaking something or someone. both maybe. As far as public forums go, you can't read emotion very well. that's a dicipline in itself. I will admit, there are a few that can be taken wrong by how they convey there message. Except Mike walsh and musher0. I'm mostly an observer and learner but those two stand out as the most friendly people I've ever....read. LOL. Semme, if he is still around., has my respect for sheer wealth of knowledge packaged in a seemingly first glance textual arrogance. Not a personal opinion of character, just easy to take the wrong way through grammar. As far as an out of the box normal puppy, I dunno. Nothing is going to be like that. Never has for me. Reminds me, as a mechanic, I always wondered why there had to be so much complicated computerized equipment that seemed to change everyday. battery in the wheel well, in the trunk, under the seat. alarm systems tied into things that are not accessible to the average joe. I'd love to buy a car that had the simplicity of a Chinese scooter. Not gonna happen in the big corporate USA. Parts and service are a huge profit percentage. I just have to accept it. I could go to a motor forum and complain but that's not gonna change a dang thing. I just have to learn and adapt, take the good with the bad and try not to go mentally insane. Create a new folder in your home directory. and install this Etcher.io program into your MS Windows operating system (or MacOS or Linux 32 bit or 64 bit). Insert a blank USB Flash drive into USB socket on your computer. Execute the Etcher program. Select XenialPup 7.5 .ISO file. Then select the USB Flash drive. Now start the process to write the selected .ISO file into the selected usb flash drive. This will overwrite the previous contents of that usb flash drive. None of the previous contents of the usb flash drive will be saved! 10 minutes, 2 downloads, 1 USB Flash Drive. Test PuppyLinux using a MS Windows computer. How Can I test drive a Linux or BSD Distribution, starting from MS Windows and a USB Flash Drive? First Download try with Slacko 6.3.2 Puppy Linux .ISO file 200 Megabyte download.Here is the download URL Link http://slacko.eezy.xyz/download.php 32 bit or 64 bit your choice! Optional USB Writer program Etcher, 70 Megabytes download for MS Windows, MAC OS, Linux. URL Link http://etcher.io Burn images to SD cards & USB drives, safe & easy. Use Rufus.exe or Etcher.io to write / burn the .ISO file to a USB Flash Drive. Leave the USB Flash drive inserted and reboot the computer. The computer should boot from the USB Flash drive. If not change the BIOS drive boot order to boot from a USB Flash Drive first, the CD-ROM second, and the hard drive third.